Disorganization, confusion, incomplete or faulty implementation of plans characterized the initial phases of the landings. This was especially true of the airborne landings which were badly scattered, as well as the first wave units landing on the assault beaches. To their great credit, most of the troops were able to adapt to the disorganization. In the end, the Allies achieved their objective. After overrunning the German beach defenses, the Allies rapidly expanded the individual beachheads, and the workhorse amphibious craft quickly reinforced the lodgment with new troops, munitions and supplies. Superior Allied naval and shore-based artillery then helped defeat the initial German counter-attacks at the same time that Allied dominance of the air hindered the transportation of German reinforcements to the region. By 25 July, the Allies were strong enough to launch Operation COBRA and begin the liberation of France. In a larger strategic sense, the successful Allied landing in France was a psychological blow to the German occupation of Europe. It called into question the German Army's ability to control western Europe, dramatically increased partisan activity against enemy occupation, and heartened the spirits of all those fighting against Nazi tyranny. The balance of power on the continent, already weakened by Soviet offensives into Poland, was decisively tipped into Allied favor. From that point on, the Allies would begin the drive into Germany that ultimately destroyed the Nazi regime on 7 May 1945. 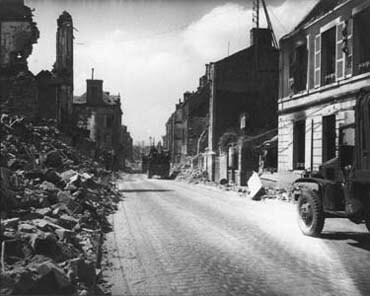 Members of the 1st Bn, 355th Engineers, cleaning through wrecked streets of St Lo so that traffic could move by road from Omaha beach. If you would like to see any footage of D-day click this link below and it will take you there.